London, January 28: It is not an unknown or a concealed subject, Balochistan, the most restive province of Pakistan has for years been captive of the atrocities forced on them by Pakistan. Throwing light on the plight of the people, Baloch Republican Party (BRP) workers held a seven-day awareness campaign outside the United Kingdom Prime Minister's office in London to highlight the unending killings, enforced disappearances, and alleged human rights violations in Baluchistan. The campaign was started on 19th January and concluded on January 26th. BRP leader Mansoor Baloch while addressing the protesters urged the UK government to take notice of human rights violations in Balochistan and intervene in the issue. The protesters urged to pressurise the Pakistan government for releasing hundreds of Baloch missing persons reportedly lodged there. 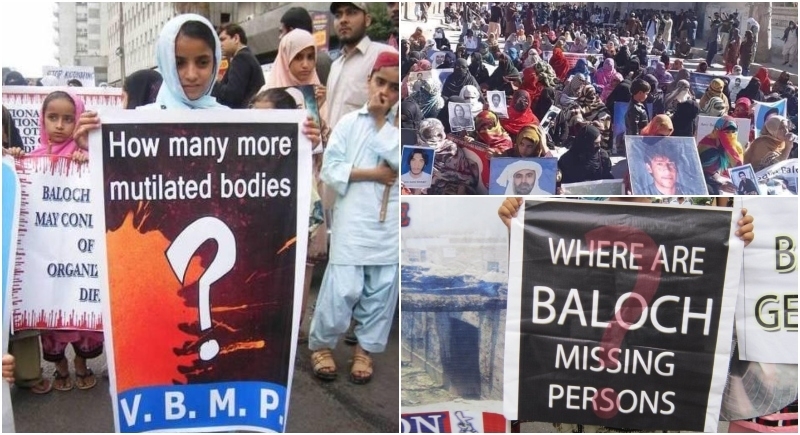 Voicing their stance on this torture and dreadful life of millions, it has been seven decades that thousands of people including women & children have disappeared in Balochistan, many have been recovered dead bodies on roadsides with signs of extreme torture. Pakistan has been torturing and enforcing mass abductions and killings specifically targeting women and children. With every passing day Baloch is becoming a victim of Enforced Disappearances and extra judicial killings. It is time that the UN should take a serious step to End Enforced Disappearances and ensure the safety of every individual in Balochistan. The prevalent unrest, due to extreme poverty, instability and the systematic looting of the natural wealth of the resource-rich province, is being accentuated by the build-up of the China Pakistan Economic Corridor (CPEC) that is looked upon yet another attempt by the federal government to fully colonize the region. Pakistan is committing the worst forms of crimes in Balochistan. In January 2014, three mass graves containing more than a hundred bodies were discovered in Tootak, Khuzar. Another mass grave was discovered in Panjgur in July 2018. In 2019, at least ten dead bodies were discovered near Quetta and hurriedly buried in Dasht Tera Mill area of Quetta without ascertaining their identity. Pakistan has been committing gross human rights violations in Balochistan since it occupied the sovereign Baloch state in 1948. Soon after joining the United Nations, Pakistan violated UN’s charters’ article one, which restrains member states from breach of peace and the use of force against other states. The United Nations was silent then when Balochistan was occupied and it is silent now while Pakistan is committing genocide of the Baloch people. There are Pashtuns who are also missing in the thousands; hence we feel the pain of the Baloch people. The demands of the Baloch and Pashtun people are not outside the circle of Pakistan's constitution; rather, the Baloch and Pashtun are simply asking for the basic right to their resources, hence are being disappeared at the hands of the Pakistan army. The people residing within the restive province cannot get their anguish heard since the region is being kept behind the proverbial iron curtain by the government and the army. Under such circumstances, the responsibility to sensitise the international community about the atrocities being committed over there falls on a small group of exiled expatriates who reside mostly in Europe. This group puts in all that it can for the sake of their land and their people. Pakistan's policy of abductions and killing has completely failed, adding that Baloch will not back off from their basic demands and will appeal to all European Union member states to take cognizance of the gross human rights violations and take practical steps to put an end to it. The Free Balochistan Movement are trying every medium possible to highlight their issues and seek help from the United Nations and every other forum.